James W Rende Jr., Architect at COOPER KESSEL Architect & Associates, in Sonora, California, has over 30 years experience in designing and building Sustainable Design projects. James Rende is a native of California, born in San Francisco. He attended San Francisco City College for two years. In 1971 he attended Schiller College in West Germany, and traveled extensively through Europe during this period. He also traveled through parts of Africa, before returning to the United States where he attended the University of New Mexico in Albuquerque. While in New Mexico, Jim received a wide range of experience as an Architect. He worked on residential homes, but was primarily involved with Commercial and Public Works Projects. In 1997, Jim was the President of the Sierra Valley Chapter of the American Institute of Architects, and holds a limited services credential at Modesto Junior College in the Math and Engineering Department, where he has taught courses in Architecture. He has served his community as a member of the Modesto ‘500’ Lions Club from 1984 to 1999. 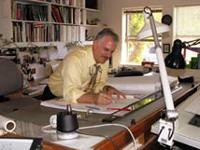 Jim oversees individual projects and coordinates architectural production. Although he has been involved in numerous residential projects ranging from custom homes to apartment complexes and condominiums, his primary area of expertise lies in commercial and public works projects. His experience includes such work as hospital remodels and additions, nursing home design, doctor’s offices, maximum and medium security prisons, and Department of Defense projects, as well as office buildings, industrial buildings, auto dealerships and restaurants.